NBA Fantasy Breakdown (Sun. 2/10): Time to Buy Low on Kevin Durant? 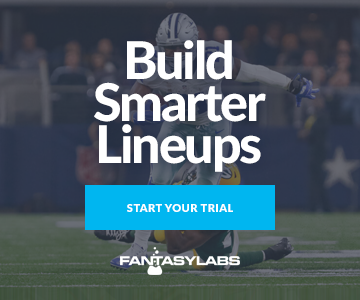 Sunday’s main slate differs by site: DraftKings features a three-game slate starting at 6 p.m. ET, while FanDuel features a two-game slate starting at 7:30 p.m. ET. De’Aaron Fox has been an awful fantasy asset recently, posting an average Plus/Minus of -5.44 on DraftKings over his past 10 games. That said, his salary has decreased by -$900 over that time frame, and he’s in an excellent spot today vs. the Phoenix Suns. They rank just 29th in defensive efficiency this season, and the Kings’ resulting implied team total of 120.0 points ranks first on the slate. Fox also has a strong individual matchup, resulting in an Opponent Plus/Minus of +1.87. The best matchup at the position belongs to D.J. Augustin. He’s taking on the Atlanta Hawks, who have played at the fastest pace in the league this season. Orlando is currently implied for 110.5 points, which represents an increase of more than five points when compared to their season average (104.9). He’s a nice value at $4,500 on DraftKings. If you want to go a little more contrarian, you can target Isaiah Briscoe in the same matchup. He hasn’t been quite as effective this season, averaging just 0.65 DraftKings points per minute, but he’s projected for 20 minutes in our NBA Models. He’s also dirt cheap across the industry, owning a salary of $3,100 on DraftKings and $3,500 on FanDuel. Trae Young has somewhat quietly started to figure things out at the NBA level, posting an average Plus/Minus of +6.61 over his past 10 games. Credit: Jason Getz-USA TODAY Sports. Pictured: Atlanta Hawks guard Trae Young (11). He’s posted a positive Plus/Minus in nine of those contests, so he’s been a consistent option as well. He’s the best pure value at the position on DraftKings, where his $6,800 salary comes with a Bargain Rating of 86%. Steph Curry hasn’t shown a big ceiling recently but has been a reliable option, posting a Consistency Rating of 92% over the past month on FanDuel. His salary has also decreased by -$1,000 over that time frame, and his current $9,200 salary comes with a Bargain Rating of 88%. He leads the position with 11 Pro Trends and possesses the highest ceiling at the position by a considerable margin. Devin Booker is listed as questionable for today’s contest vs. the Sacramento Kings, but head coach Igor Kokoskov said there’s a very good chance that he’s able to suit up. If he does, he’s in an excellent spot. The Kings have played at the third fastest pace this season, making this a nice pace-up spot for the Suns. They’ve also been merely average in terms of defensive efficiency. T.J. Warren and De’Anthony Melton also remain out, and Booker has led the team with a usage rate of 32.8% with both players off the court this season. Terrence Ross has been balling recently, scoring at least 38.5 FanDuel points in three of his past five games. He was limited to just 25 minutes in a blowout in his most recent contest, but his playing time also figures to be more secure after shipping Jonathon Simmons to the 76ers. Ross has averaged a stout 1.01 FanDuel points per minute over the past month, so he can do a lot of damage when given the opportunity to play consistent minutes. Evan Fournier is also worth some consideration for the Magic. His ceiling hasn’t been quite as high as Ross’ lately, but he is the more reliable source of playing time of the two. He’s an excellent value on DraftKings, where his $5,000 salary comes with a Bargain Rating of 95%. Bogdan Bogdanovic could be a big winner from the trade deadline. The Kings traded Iman Shumpert to the Houston Rockets, and as a result, Bogdanovic has played at least 31.5 minutes in each of his past two games. He’s averaged 0.99 DraftKings points per minute this season, and his $5,000 salary on DraftKings results in a Bargain Rating of 93%. Kevin Durant is really the only option if you want to pay up at SF on today’s slate. That said, he hasn’t been worth his lofty price tag recently, posting a positive Plus/Minus in just two of his past nine games. His usage rate has taken a pretty large hit since the return of DeMarcus Cousins, dropping from 30.9% over his first 45 games to just 27.1% over his past nine. That said, Durant still seems like a candidate for some positive regression moving forward. He’s shot just 28.2% from 3-point range over his past nine games, which is nearly 10 percentage points lower than his career average. He’s also seen a slight decrease in his rebounding numbers of that time frame, although that could be a product of sharing the court with an excellent rebounder in Cousins. Credit: Kyle Terada-USA TODAY Sports. Durant’s salary has decreased by -$700 over the past month and he’s projected for less than 25% ownership on DraftKings, which makes him an interesting buy low candidate for guaranteed prize pools (GPPs). Harrison Barnes is still getting acclimated to life in Sacramento, but he’s coming off greater than 36.5 minutes of playing time in his most recent contest. That’s a lot of potential playing time at just $5,100 on DraftKings, especially in a great matchup vs. the Suns. He might not possess the highest ceiling for GPPs, but he’s a strong option for cash games. Mikal Bridges continues to impress for the Suns, posting a positive Plus/Minus in each of his past nine games. He’s also displayed a nice ceiling for his salary, scoring at least 35.0 DraftKings points in three of his past five games. The Heat have a pair of intriguing options at the position in Justise Winslow and Josh Richardson. Winslow has served as the team’s starting PG with Goran Dragic out of the lineup and has averaged 0.89 FanDuel points per minute this season. Richardson is a good bet to lead the Heat in minutes today and is coming off 35.5 DraftKings points in his most recent contest. He’s a nice value at $6,100 on DraftKings, resulting in a Bargain Rating of 83%. Both players would also see a definite boost in value if Wade is unable to suit up. Aaron Gordon is currently listed as questionable for today’s contest vs. the Hawks after landing on his back during his last game. He’s in an elite spot if he’s able to suit up: The Hawks have been destroyed by PFs all season, giving Gordon an Opponent Plus/Minus of +2.00 on DraftKings. Credit: Jeff Hanisch-USA TODAY Sports. Pictured: Orlando Magic forward Aaron Gordon (00), Milwaukee Bucks forward Khris Middleton (22). If Gordon is unable to go, Jonathan Isaac would become an elite option at the position. He’s posted a positive Plus/Minus in 14 of his past 15 games and has averaged a Plus/Minus of +8.56 over his past 10. He warrants consideration on DraftKings even if Gordon is able to suit up given his Bargain Rating of 92%. No one really stands out at the PF position from a value perspective, so I wouldn’t look to pay down too far on today’s slate. Josh Jackson isn’t exactly cheap at $6,200 on DraftKings, but he’s provided an elite average Plus/Minus of +10.82 over his past 10 games. His current price tag also results in a Bargain Rating of 89%. If you do want to pay down at the position, Harry Giles could be an interesting option for GPPs. He rarely sees more than 20 minutes, but that hasn’t stopped him from scoring at least 25.25 DraftKings points in two of his past three games. That kind of production gives him an appealing ceiling at just $3,500 on DraftKings. Draymond Green might be the best “ceiling-raiser” in the NBA, but the Warriors just don’t need him to do as much since the addition of Cousins. That said, his salary has seen a pretty drastic price decrease across the industry over the past month, which gives him some appeal. Nikola Vucevic is in a potential smash spot today vs. the Hawks. The Magic are in the top pace-up spot of the day, and the Hawks have struggled against opposing centers this season. Vucevic exploded for 55.5 DraftKings points in his first meeting vs. the Hawks this season. Vucevic would also be one of the primary beneficiaries if Gordon is ultimately ruled out. He’s seen a usage bump of +2.1% with Gordon off the court this season, and Vucevic has averaged a Plus/Minus of +3.5 on DraftKings in four games without Gordon this season. On the other side of the same matchup, Dewayne Dedmon will likely be tasked with trying to contain Vucevic for much of this game. That could make him a strong target at $4,800 on DraftKings. He’s averaged 1.08 DraftKings points per minute over the past month, so a few additional minutes in this contest would make him a strong value. Hassan Whiteside is the ultimately high-risk, high-reward option. He’s played at least 28 minutes in each of his past three games, and he’s averaged a dominant 49.5 DraftKings points per game over that time frame. Whiteside has averaged 1.50 DraftKings points per minute over the past month, so the fact that he’s succeeded with extra playing time is not exactly surprising. There’s no guarantee he sees that many minutes today vs. the Warriors, but his upside is tough to ignore at $7,100 on DraftKings. Credit: Jennifer Stewart-USA TODAY Sports. Pictured: Phoenix Suns center Deandre Ayton (22). Deandre Ayton has averaged a strong 1.17 DraftKings points per minute over the past month and is in an excellent spot today vs. the Kings. It results in an Opponent Plus/Minus of +2.55 on DraftKings, and his 11 Pro Trends are tied with Vucevic for the most at the position.